from 60 pcs. 0,30 EUR ea. from 140 pcs. 0,27 EUR ea. from 360 pcs. 0,25 EUR ea. The convenient solution if you want to glue on a disc magnet. 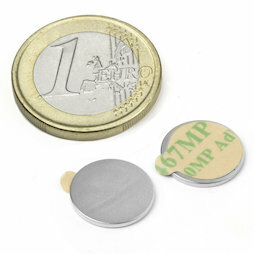 This is a very flat disc magnet (13 mm diameter, 1 mm thin) with a self-adhesive side. Simply remove the film and it glue on. With this magnet you can turn any surface into a bulletin board in no time and you can hang up photos without drilling holes. The same principle applies of course to the closing of a cardboard box, an invitation card, etc. ... and your name tag is ready. You can find tips and tricks in our FAQ about name tags.